Another 52 Weeks #5: Tips & Tricks- Personalize It!! Ink Transfers- How I do it. So a number of folks have asked me about the method I use to put images and lettering on my projects. I thought I would use today’s blog as photo tutorial of sorts to answer this question. 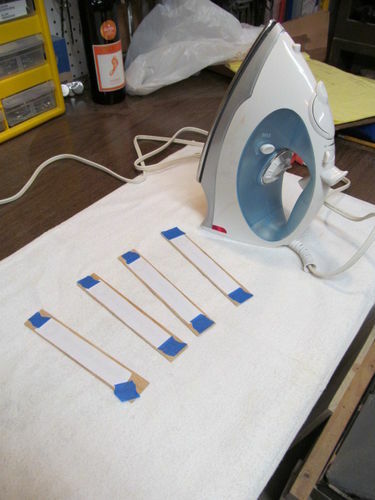 A few years back I ran across a Youtube video of a guy doing an ink transfer method using a laser printer and an iron, I have been working with this idea ever since. 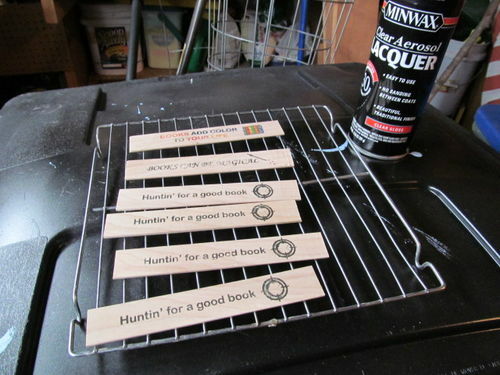 For this project I thought I would make a few bookmarks. First thing you will need to do is create the image in whatever program it is that you like to use. I learned a long time ago how to do a lot of different things in PowerPoint and still use it today to manufacture pretty much all of my image, game boards and anything I use. 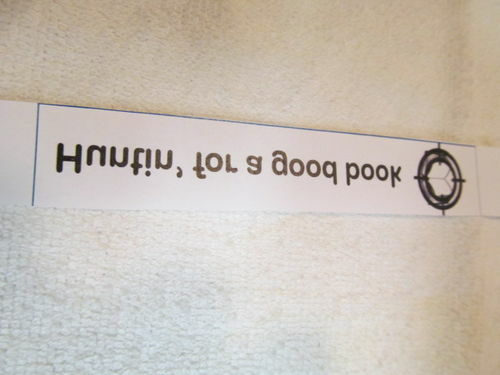 When they are printed out remember that they need to be printed in reverse. This must be printed using a laser printer or else can be photocopied using a laser style copier, the trick is that the ink has to fused to the paper using heat. 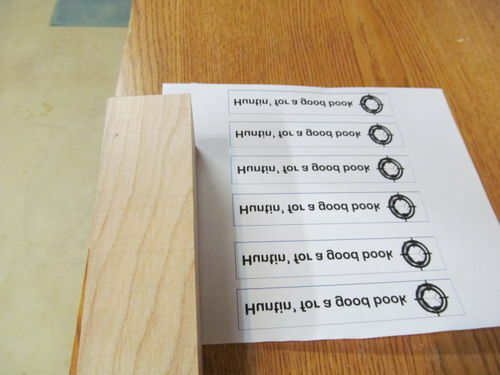 An ink jet will not work for this method. For this project I cut a block of maple into thin strips on my bandsaw and then sanded them flat. Sanding I have found is big key to this. My game boards are sanded at my belt sander and I use at least 3 grits to get them as smooth as possible. You want the flattest surface possible to transfer to. 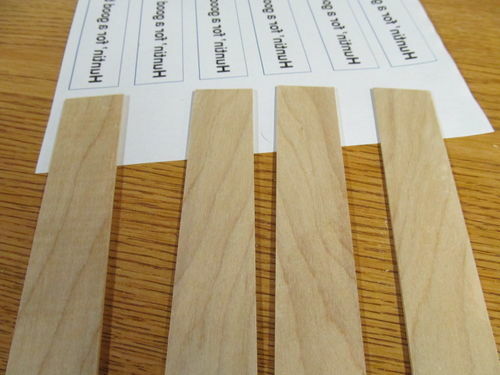 Cut out your patterns, be sure to leave only those lines you want on the wood. 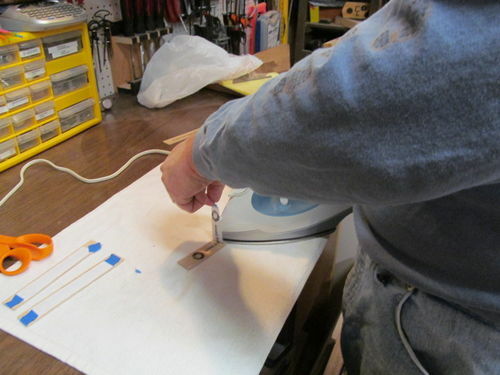 I use standard blue painter’s tape to attach the pattern to the wood. Here you can also see the iron I use. I had a much older one with a steel sole that seemed to work better but it died a few months ago. I had to buy few different ones to try out as they no longer make ones like the old one. I found the Teflon coated one did not work very well for some reason. As you can see here I use a towel to protect my bench and also to help keep things from sliding around. Let the iron heat up to its highest setting. Then apply to the piece. You want to move over the piece for a good few minutes the time depends on how much is to be transferred, most of my games take about 2-3 minutes of ironing time. I usually use the music playing in my shop to time my ironing of those, one song and it is generally good. These guys took closer to a minute each. Once you think you are good keep your iron just in front of where you are going to start to pull the pattern off. 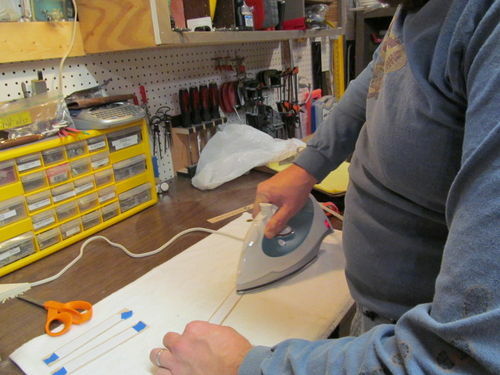 By doing this you can usually put the pattern back down and iron it a little more in certain spots if needed. You also need to keep the paper hot as you peel it off otherwise the ink may stick. I will generally give things a minimum of about 10 minutes or so to cool down. If you have a lot of colors or ink on something you may want to let it sit overnight. Most of my items are then sprayed with Lacquer, 3 coats. 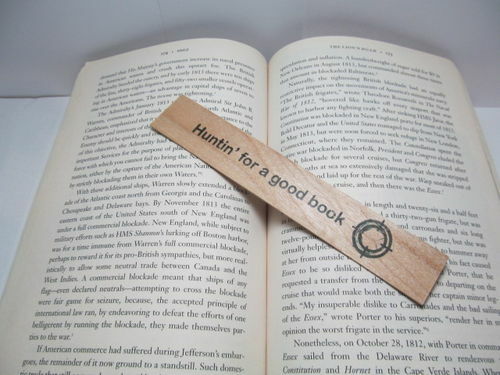 This will put a nice seal over the ink. As I mentioned none wanted lines, even the smallest will show up. 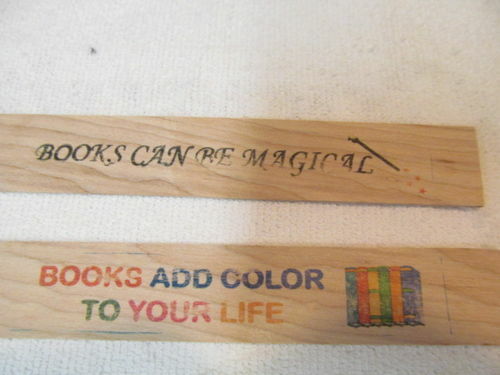 Here you see two bookmarks that I left just a bit of the outside line on. The great thing about doing the transfers this way is that you can do pretty much anything you want. I do customized Wine Tilts and Bottle Openers and can put anything the customer wants on the piece. Below are just a few of the projects that I have done using this method. When I am turning the process is pretty much the same, but since this is already a pretty long blog I think I will cover that next week. I hope this helps and gives you all some great ideas. Love to hear some feedback or questions. Hi Chris. Great tutorial about this transferring method. This is something that I keep thinking about but haven’t tried yet. Like you said, gives it a personnel touch. Gonna get to it soon. Thanks for giving us the opportunity to share with you. Great tips !!! Thanks for sharing. Thanks all, hope you can put the concept to good use. Thanks for this tutorial Chris … Your timing is perfect as I have a project on my bench right now that I want to use this method on.